Your dryer exhaust vent system is an often forgotten detail in your home but it can be a nuisance and quite possibly dangerous. Ideally, we want a solid metal duct from the dryer all the way to the point it exits the home. We also want to make sure the dryer itself has the rated capacity for the equivalent length of the vent duct. It is fairly easy to calculate the equivalent length. The first step is to measure the actual length from one end to the other. Sometimes, it will be very short, less than one foot if it exits straight out the wall of the laundry to the exterior or it can be quite long. In recent new construction, I have seen laundry rooms in the center of the ground floor plan with the vent duct extending up into the attic above the second floor and out the roof for an actual length of 40 or 50 feet. Once you have the actual length, you need to count every place the duct changes direction. For every 90 degree bend, add 5 feet. For each 45 degree bend add 2 1/2 feet. The total of the actual length and the turns is the equivalent length of your vent duct system. The building code has a lot to say about exhaust vents in general and clothes dryer vents in particular. What follows are excerpts from the 2015 International Residential Code and some explanations of why each is important. Every exhaust system in your house carries unwanted moisture and contaminants away from the interior. We NEVER want to move and concentrate that moisture to another location inside the structure. Venting bathrooms or clothes dryers to attics or crawlspaces will create enough moisture to promote mold growth and will provide an ideal environment for wood destroying organisms (of which their are many) to attack your home. Remember the cardinal rule of protecting your home. Moisture is ALWAYS the enemy. Everything that destroys your house requires water. Dry wood will not be attacked by the vast majority of organisms that destroy wood and wood products. The clothes dryer produces heat, moisture and lint. Lint are particles of your clothes that shed during drying. This detritus is quite flammable. Dryer ducts need to be as smooth as possible to avoid trapping the lint in the duct and creating a blockage. A partial or complete blockage is a serious fire hazard. Avoiding the buildup of lint in the duct system is of primary importance. The code gives us the method for determining the equivalent length of our duct system as described earlier but it says the limit is 35 feet. How are those new homes getting away with 50 feet or more equivalent lengths? The code provides for longer than 35 feet equivalent length IF the manufacturer of the Clothes Dryer specifies this in the installation instructions for the appliance. 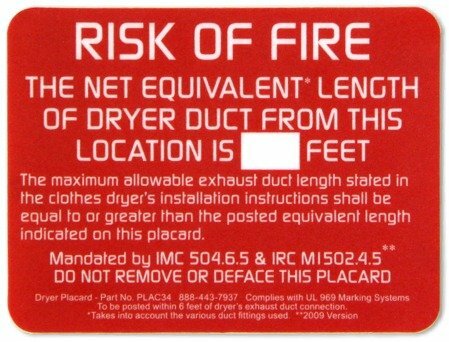 If the equivalent length exceeds 35 feet then this information must be permanently displayed within 6 feet of the dryer location in the home. 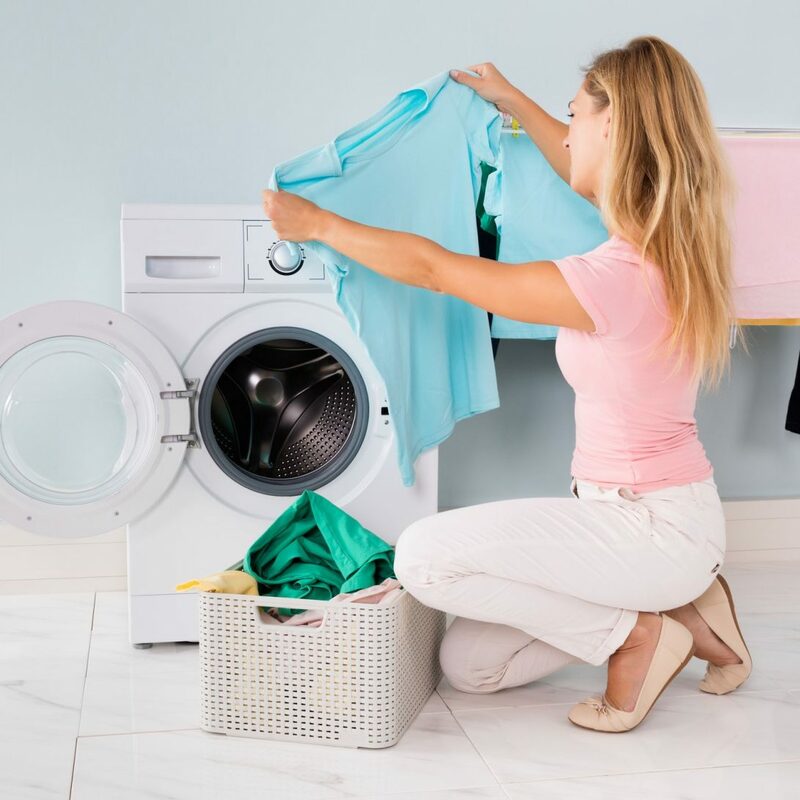 Be sure to determine your dryer duct equivalent length and also be sure your clothes dryer is capable of pushing the warm, moist, lint filled air completely through the duct and safely outside. Keep your lint screen clean, clean behind the dryer monthly and make sure your duct system is working properly by observing the warm air flowing from the duct exit on a regular basis.